Posted in Lama Zopa Rinpoche Bodhichitta Fund, . The children of Maitreya School and Tara Children’s Project attending a talk by Lama Zopa Rinpoche about the Eight Verses of Thought Transformation. January, 2017. Lama Zopa Rinpoche was in Bodhgaya, India, for several weeks from late December 2016 through February 2017. During that time Rinpoche attended the Kalachakra initiation offered by His Holiness the Dalai Lama, went on pilgrimage to many holy sites, met with students and other lamas, and visited and made offerings, through the Lama Zopa Rinpoche Bodhichitta Fund, to three very important FPMT social projects of Root Institute: Maitreya School, Tara Children’s Project, and Shakyamuni Buddha Clinic. Lama Zopa Rinpoche giving gifts to the children of Maitreya School and Tara Children’s Project. January, 2017. Maitreya School is a free school benefiting impoverished children from Bodhgaya and neighboring villages. The children not only have the chance to obtain a traditional education but, more importantly, they receive life skills in compassion, honesty, and loving-kindness presented through Buddhist study. This is the core of the training and vision of the school: making lives meaningful. Tara Children’s Project (TCP) is the only children’s home caring for HIV-affected orphaned children in the state of Bihar. Currently there are twenty-one children living there. Shakyamuni Buddha Clinic began in 1991 as a home for the destitute and has evolved into a diverse community health program encompassing a wide range of medical and rehabilitative services and health promotion activities. Services included allopathic medicine, homeopathic medicine, health promotion and education, and patient care. 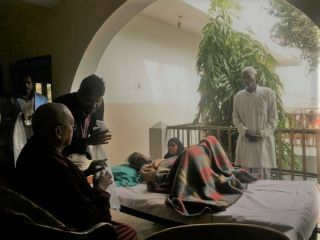 Lama Zopa Rinpoche blessing a very sick patient of Shakyamuni Buddha Clinic. January, 2017. While at Root Institute, Lama Zopa Rinpoche offered new shoes, socks, toothbrushes, toothpaste, soap, and new towels to all the children of Maitreya School and Tara Children’s Project. Rinpoche also met with the children and gave a talk on Eight Verses for Thought Transformation. At the Shakyamuni Buddha Clinic Rinpoche offered INR₹500 plus a blanket to mothers who have children with cerebral palsy. While there Rinpoche also blessed everyone in the clinic on that day and offered extensive prayers for a number of people who were extremely sick. Rinpoche also thanked all of the doctors and nurses of the clinic who offer such an incredible service to those in need. Please rejoice in the incredible social services offered by Root Institute which benefit so many in need in the area. For the past six years, due to the kindness of one main benefactor, the FPMT Social Services Fund has been able to offer substantial grants toward this amazing work.